For the first time, the army tested its battlefield satellite real-time imagery to map the entire built up terrain of the exercise area comprising Jalandhar and its outlying areas like Nawashahr, Nakodar and Moga. The Israel-built Loros radars were also tested in operational conditions for the first time. 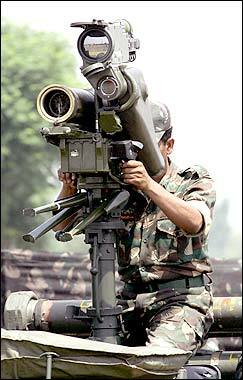 An Indian soldier uses a Charac Teristics rangefinder of a 40 mm L/70 gun.